Kungliga Bibliotek, ms. A. 144, folio 34, in Stockholm (Alexander, p. 14). This full-page illustration has three men wearing square boxes on their belts. There are not many details, but I have interpreted the boxes as penners. These figures apparently represent the Evangelists, who were often shown with penners and inkhorns. In these illustrations, I do not see ink bottles. The penners look wooden to me, because of the decoration and squared off bottom of the one on the left. The penners may hang to the men’s knees, or they may reflect the rather primitive style of drawing. Or maybe the man on the right really is a dwarf. There are several depictions of penners and inkhorns in this manuscript. 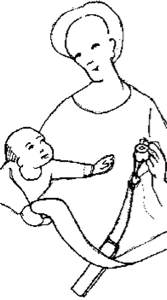 There is even a charming picture of the Madonna keeping the inkhorn away from the reaching Child. In the next miniature, the scribe has taken his penner and inkhorn off his belt and laid it across the table, so that he may more easily use the bottle of ink. The “fluffs” on either side of the penner, halfway down, may be the ends of the cord, frayed into a tassel. 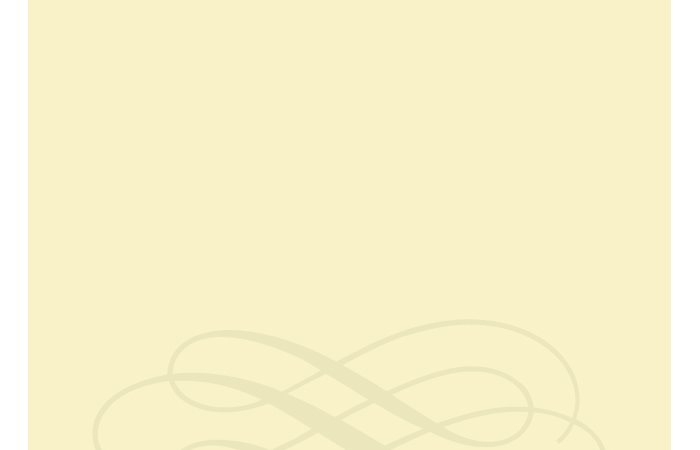 The penner itself is light-colored, and appears to taper towards the base. It has more than four sides -- either six or eight. It appears almost circular in cross-section. The penner appears longer than the pen he is holding, but not very large around. To my eye, it looks like wood. The final illustration is of St. Mark. His symbolic animal, the lion, holds the Saint’s penner and inkhorn set by the strings. Again, the penner is a light color, perhaps wood, and six or eight sided. It tapers towards the base. Oak, painted surface, in Wallraf-Richartz Museum, Cologne (Fisher, p. 144). The black penner and inkhorn are looped over Saint Luke’s belt by the red cords that join them. The set is fairly small, and the penner is barely larger than the size of a couple pens. Both items look as if they were made of leather. Fisher notes that the presence of a penner and inkhorn as part of a saint’s clothing generally indicates that the person so represented is one of the Gospel writers, i.e., Matthew, Mark, Luke, or John. But neither Mark nor Matthew is shown with penner and inkhorn in this set of paintings. 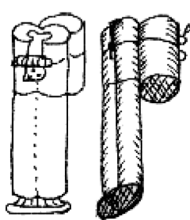 The inkhorn is on the right, with strings clearly going through the top, then through a bead before looping onto the belt. It looks like the strings have been pulled up behind the belt, then the two items pushed through the loop thus formed, to both hang on the same side. This is a more secure method of hanging it from the belt. The penner is fairly small and looks light. It tapers slightly towards the base, and could be a rectangle or circle in cross-section. There appears to be a frayed cord end midway down the body of the penner, showing where the strings stop. The penner looks like leather. He has a third, unidentified item hanging from his belt on the left. Perhaps it is a small money purse. Oak, painted surface, in the National Gallery, London (Fisher, p. 145). This painting is obviously a companion piece to the previous one, but its current location is in a different museum. The original site of these panels was not given in the text. The black penner and inkhorn are looped over John the Evangelist’s belt by the black or dark brown cords that join them. His writing implements are also symbolic of his role as Gospel writer. There seems to be a tassel from the knotted end of the cord on the left side of the penbox. The ink bottle is roughly conical, rising from a wide base, with a large rim next to the smaller stopper. This shape is slightly simpler than many of the ink bottles. This is a copy of Mare Historiarum by Giovanni Colonna (ca. 1448-9). Folio 1 shows an anonymous illuminator receiving visitors. This picture is on the cover of Alexander’s Medieval Illuminators. On the table beside the book is a penner and inkhorn. It is hard to distinguish any details. The set is black. Penelope is writing a letter to Ulysses with her right hand. Her left hand is on the table, with the ink pot placed just above it. Lying on the table next to that is the penner. Both penner and inkhorn are black. The penbox appears to be just slightly longer than her hand in length. The cords joining the two pieces are also black, and just barely distinguishable. This room is paneled in trompe l’oeil marquetry, employing walnut, oak, beech, rosewood, and fruitwoods. In one of the pictures of a partially opened cabinet is the picture of a penner and inkhorn hanging from a hook. The penner is wider at the top, tapering to the base. It is obviously of wood, with a carved design on the lid and the body of the penbox. The cords appear to go into the top, not along the outside. There is also no evidence of the cord at the bottom of the box, either in the original depiction nor in the shadow it casts on a nearby book. The cords are hung over a hook, and go through a bead before they split again to go through the top of the inkhorn and thence to the body of the ink bottle. The ink bottle looks similar to the one on the statue, below. It is unclear of what material it is intended to be made. There is no evidence of knots around the ink bottle. It may be that the cord ends are hidden in the box, and the center of the cord goes around under the far side of the bottle’s lip. This is one of the most detailed depictions of a penner and inkhorn that I’ve found. Notice how the strings go from the inkhorn’s rim through the sphere on top of the lid. The strings clearly go through, but do they go vertically, or do they cross in the center of the sphere? I don’t know, but the latter would provide more friction to keep the lid out of the way when it is being used. National Gallery of Art, Washington, DC, Samuel H. Kress Collection, 1939. The artist is Florentine, 1462 - c. 1521. (Walker, plate 70). I saw this painting in 1992. The man seated on the right (St. Anthony Abbot) is writing. He is holding the inkhorn, and his open penner is on his lap, facing us. This shows what the inner construction of a penner was, at least in this instance. The painting is very large, so this detail was at eye-level, perfect for taking notes. 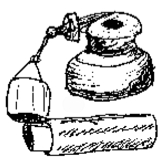 The cords go through three loops attached to the side of the penner, through the penner’s cap, and thence to the inkpot’s cap and bottle (as much as is visible) in a manner similar to the others described here. The penner’s top is roughly triangular. Inside, there are two or three tubes, one with pens, one with a pen-knife. The penner and inkhorn are both black. The penner appears to be shaped in leather. The bottle of ink also appears to be either leather or fully covered in leather. The miniature painting of St. John shows the Evangelist holding the ink bottle in his left hand, rendering the bottle barely visible here, with the penner hanging down by his knee. The penner is black, perhaps leather. It is fairly small and slender. It may taper towards the base slightly. Walters Art Gallery (27.299), polychromed wood. I saw this example in the Walters Art Gallery, Baltimore, MD, in September, 1991. The sketch is from a wooden statue from a Crucifixion Group of St. John. The penner appears to be a flat box in shape. The cord runs through a tube on either side of the top of the box, allowing the scribe to remove the top without having it become detached. The cord goes through a similar tube on each side of the bottom of the case, and is knotted at each side of the base of the penner. The other end of each cord goes through a hole on opposite sides of the top of the ink bottle. The cords then loop around the bottle proper, under an upper lip. Thus, the noose of cord supports the ink bottle. Each part is fairly small, and the whole thing hangs no lower than about mid-thigh. From the carving, it looks as if both might be made of leather. The arrangement strikes me as convenient, but with potential for an ink disaster. The ink bottle must be securely fastened before looping it over the belt. The lady shown here (Anne of Brittany) has a flat, rectangular penner attached by a short set of strings to the inkhorn. Next to it is the matching penknife. It appears that a matching penner, inkhorn, and penknife combination is a reasonable writing set. The penknife is also flat, with a fairly long, thin blade. The set is black, with details in gold or brass. The penner has two loops on the lid, and three loops on the body for the strings to go through. The ink horn appears to be made of metal. The penner might be metal or wood. Louis XII’s set is also black, with gold or brass details. There appears to be more decoration on the top of the flat box-shaped penner. He, too, has a matching penknife. The inkhorn is clearly made of metal, and the penner might be metal or wood. Anne’s next penner and inkhorn set is either gold or brass. The painted depiction is yellow, indicating that it is either made of a yellow metal or is gilded. Her penknife has a black handle and brass or gold nails and details, and looks like the one from the first set. The penner again is a flat, wide box. The metal inkhorn is a round-bodied bottle with a narrow opening at top. The yellow cords can be seen, but not the top of the inkhorn. Finally, there is an illustration of a poor man with ragged clothing. He has a penner and inkhorn at his belt. It’s plain black, like leather. It is relatively small, and tapers towards the tip. Obviously even a poor man may own a set. MS Fr. 875, fol. 124v , Bibliothèque Nationale, Paris. (Fox, December, 1997). This illustration is of a woman sitting in bed, with pen in hand, paper to her left, and a penner and inkhorn open on the coverlet before her. The penner is small and tubular. It looks like it would hold only one or two pens, and no penknife. The outer case is red, the inner lip on the base is brown. It looks to me like a painted wood cylinder. The lid should slide over the inner lip of the base to hold it closed. The penner’s lid is clearly attached to the lid of the bottle of ink, which is open. The bottle is cylindrical, with a wide base, a pinched waist, and a slightly larger cap. The bottle is black. The whole effect is more dainty and colorful than others seen prior to this. It also clearly shows that a woman may find a use for a penner and inkhorn. The ink bottle is far larger than the penner. The pen that she is using is also slightly longer than the penner that supposedly contained it. I suspect that is an error on the part of the one drawing the picture. National Gallery of Art (Alisa Mellon Bruce Fund, 1967.4.1). (Walker, plate 169). I saw this painting in 1997. The artist is Flemish, and has been known to paint Spanish patrons, so the nationality of this merchant is not clear. From his clothing, however, I would say the merchant is northern European, rather than southern. The merchant is writing something and has many artifacts related to writing on his desk before him. One is his opened bottle of ink, attached to the penner that is angled across the table and out of the picture. My sketch from the painting is shown in the figure. Note that the top of the inkhorn fits into the bottle and goes rather more deeply into the neck than do modern bottles of ink. The inkhorn is also of a less complex shape than many seen heretofore. This shape could more readily be made of leather. The penner and inkhorn are both black, and look like leather. The cord is an indistinct gray with purple overtones. The cord was softly twisted, as if it were a long piece of narrow fabric, or an unplied cord. 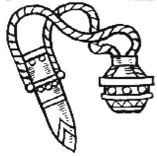 The cord clearly goes through a tube attached to the inkhorn, and is knotted below the tube. It then goes through the bottle-top, and we last see it as it emerges from a similar tube on the side of the penner, presumably the penner’s top. This is an illustration I found in Gaur’s History of Writing that shows a table with scribal instruments scattered across it. Lying in the center of the table is a penner and inkhorn. The sketch is not very detailed, but the inkwell is clearly open for use, and the penner out of the way. Thus the scribe would likely sit to the right of the table. The inkhorn is black, the penner light colored, to me implying wood. The penner and open, fallen inkhorn are lying on a table. The penner goes out of the picture on the left. The cap is lying with its inner edge toward the viewer. The inkhorn is lying on its side and has its base toward the viewer. A quill is lying on top of the two -- there is no spreading pool of ink, however. Inspiration appears to have run dry. Given that the rest of the painting has an empty overturned goblet, a candleholder without a candle, a closed book, and a skull, the symbolism of “emptiness and endings” seems clear, and consistent with the lack of ink on the table. At any rate, the penner is black, possibly leather. The cords appear to be flat leather thongs. 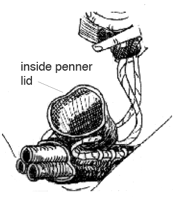 The near one runs through a short tube on the outside of the penner’s lid, then is visible again before it disappears off the edge of the panel. The ink horn is also black. The thong appears to go to the inkhorn stopper and no further. I see nothing to indicate it connects to the bottle proper. The inner part of the stopper is indented. It could be made of wood. The inkhorn appears to be a cylinder with grooves atop a fancy base. It might be wood or leather. Bottle and stopper might even be of black metal. 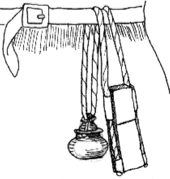 Friar’s Dictionary of Heraldry lists the “Penner and Inkhorn” as “a charge consisting of a stylized pen case and ink bottle joined by a cord.” The picture illus-trating this is shown below. Note that the cord is attached to the sides of the penner’s top, but stops at the lip of the body, presumably by going through a loop on either side, and knotted below. The cords run through the lid of the bottle, and stop at the lip, midway down. This appears to be modeled on the medieval precedent, rather than the more modern pencases. The artist may be Sir Anthony Wood. • The penner and inkhorn was carried by looping the strings over the belt, so that the penner was on one side, the inkhorn on the other. It might also be looped more securely to the belt by pulling up the center of the strings behind the belt, and pushing both items through the loop thus formed. • The cord is usually short enough so that the bottom of the penner hits the wearer no lower than mid-thigh. • The penner can carry at least a couple pens ( i.e., quills without their barbs). • Some (but not all) penners are large enough to carry the penknife, too. • It appears that penners were generally made of wood or shaped leather. The leather ones appear to have been more common. Some metal ones are attested, as well. • There may be some implications about the class of the person using the penner based on whether it was metal (kings and queens), wood (well-to-do or holy people) and the simplest leather ones (workaday). • The leather penners are generally black. Wood ones might be black, brown (unfinished wood?) or painted. From the literary references, the penner may also be gilded or made of silver. • The shape of the penner may be cylindrical, rectangular, a flat box, or six or eight sided. Most tapered towards the bottom, some did not. Most had a flat bottom. • Both penner and inkhorn have removable lids that remained attached to the body by means of strings on each side. • The outside edges of the penner and its cover often had tubes or other means of allowing a cord to attach to it externally. Few penners appear to have had the strings attach internally. • The cord generally is knotted on one side of the penner, either at the bottom or in the middle of the body. From there, it goes up through a tube or other guide on the body of the penbox, travels through a tube or guide on the lid, then loops over the belt, goes through a hole on the cap of the ink bottle, and through a hole on the rim of the inkhorn. It either ends on the side of the inkhorn (in which case there are two cords), or it continues around the neck of the bottle, and thence up through the bottle’s rim, the lid’s side, over the belt, through the lid of the penner, and back down the other side of the body of the penner. • The strings (visually two cords, but could be a single one looped around) can be made of anything sturdy and handy, such as soft string, cords, or leather thongs. • The inkhorn in this context, despite its name, does not appear to be made of horn. • The inkhorn appears to directly hold liquid ink. Only the example from the mid-1600s shows a penner-like box for the inkhorn. • None of the paintings show a splash of ink where the contents might slosh out while walking. This may mean that the lid of the inkhorn must fit very tightly. This may also mean that it is not kept as full as we normally keep our modern bottles of ink. Other sources have mentioned that the liquid ink within the inkhorn is kept in place by a piece of wadding or sponge that is soaked in the ink. So the ink is released to the pen by pressing on the ink-wet wadding or sponge. • The lid of the ink bottle appears to push into place, rather than screwing on. • The shape of the ink bottle is fairly complex. It is generally mostly spherical, with a flat base and a narrow neck at the top. Above the neck is a wide rim, with holes for the strings. The top is flat, or possibly slanted inwards, with a small hole for getting at the ink. • The inkhorn’s lid often has a bead on top for the strings to thread through. • Given the complexity of the inkhorn’s shape, I’m not sure of the material it was made from. Ceramic is easy to make in that shape, but would be fairly fragile to hang next to a wooden box, and they would bang together while walking. However, it might work fine with a leather penner. It could be turned wood, hollowed out, though that might be somewhat difficult. Leather would be fairly waterproof, but I think difficult to shape into so complex a form. Ivory or bone could be carved to shape, but the color and size is wrong for most inkhorns. • When in use, the set is taken off the belt and placed on the table. A pen and pen-knife are removed from the penner, which is usually then recapped. 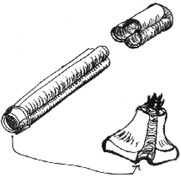 The inkhorn is placed near the writer, with the penner stretched out at the length of the cords away from the writer. This gets it out of the way. If there is no table top handy, the writer will hold the inkhorn and let the penner dangle out of the way. • I have not seen any examples of a penner balanced upright on its base (like a modern pen container) while the ink is being used. The strings are generally too short to allow this, and the penner too narrow and unbalanced. It needs to lie flat, not stand on its base. Alexander, J. J. G. Medieval Illuminators: Their Methods of Work. New Haven: Yale University Press. 1992. Backhouse, Janet. The Bedford Hours. London: The British Library. 1990. Backhouse, Janet. The Isabella Breviary. London: The British Library. 1993. Friar, Stephen. A Dictionary of Heraldry. New York: Harmony Books. 1987. Fisher, Sally. The Square Halo and Other Mysteries of Western Art. New York: Harry N. Abrams. 1995. Fox, Sally. The Medieval Woman, An Illuminated Calendar 1997. New York: Workman Publishing, 1996. Fox, Sally. The Medieval Woman, An Illuminated Calendar 1998. New York: Workman Publishing, 1997. Gaur, Albertine. A History of Writing. New York: Cross River Press. 1992. Hibbard, Howard. The Metropolitan Museum of Art. New York: Harper & Row, 1980. The Compact Edition of the Oxford English Dictionary (OED). Oxford: Oxford University Press. 1971. Raggio, Olga, and Antoine M. Wilmering. The Liberal Arts Studiolo from the Ducal Palace at Gubbio. 1996: The Metropolitan Museum of Art. Sherbring, Melinda. Notes at an Exhibition -- private notes from various museums. Voronova, Tamara and Alexander Sterligov. Western Illuminated Manuscripts of the 8th to the 16th Centuries. Bournemouth, England: Parkstone Press. 1996. Walker, John. The National Gallery of Art, Washington. New and Revised Edition. New York: Harry N. Abrams, Inc. 1984. How did itinerant scribes of the Middle Ages and Renaissance carry their pens and ink supply with them? These scribes often carried their pens (i.e., quills), pen knife, and ink bottles by hanging them from their belts. The box that holds the pens and knife is called a penner, and the bottle of ink is the inkhorn. My questions are: when was it used, how was it used, what was it made of, what did it look like, and what was inside the penner? I assume that liquid ink was inside the inkhorn. I have seen actual penner and inkhorn sets from times slightly post-1600, and I’ve seen artwork with them that date from our period. This article documents what I found. Other OED citations shed some light upon how how the penner was used, and of what they were made, and thus they are quoted here. From Trevisa, in 1398, Barth. De P. R., II.IV (1495) hiij/t “Aungels ... bere pennars and ynke hornes and other Instrumentes of wryttes.” It seems that even angels must write things down. In 1470, Henryson, in Mor. Fables, VII, Lion & Mouse, Prologue, vi, writes, “Ane inkhorne, with ane prettie gilt pennair.” Whether the penner was made of gold, or of another material that has been gilded is not clear. In 1541, in the Accounts of the Lord High Treasurer, Scotland, listed in Pitcairn, Crim. Trials I, *321. “ For ane Pennare of Silver, to keip Pyke-teithe in, to the Kingis Grace.” This implies that a penner may be made of silver, or at least bound with silver, and that at least one person has used it for storing toothpicks. In 1591, Florio wrote this conversation in 2nd Fruites, line or page 89. S: “Giue me my penknife, to make a pen.” D: “It is in your penner, you doe nothing but write.” From this we see that the penknife may be kept in the penner. In 1659, Hoole wrote in Comenius’ Vis. World xci. (1672) 187, “We put up our Pens into a Pennar (calamario).” Thus we see that pens belong in a penner, as well. The OED quotes a bill in 1463 for “Item, payd ... for a penner and a ynkorne, iij. d.” That gives a cost of three pennies. I’m not sure how that translates into money of the present, but it is clear that a person that wants a penner and inkhorn might buy one ready-made. In 1554, it cost twice as much, as the Earl of Rutland recorded on October fifth of that year, “Item paid for a penner and inkhorn for Mr. Olyver Manners, vjd.” “Vjd”is another way of writing sixpence. In 1473, Caxton writes in Chesse, 77, “On his gurdel a penner and an ynk-horn.” So the penner and inkhorn is, or may be, worn on the belt or girdle. Enough of words! Let us turn now to pictures. The following citations are generally arranged by date of the source. The boldface header is the name of the work and author or painter, if known and where it was painted in parentheses. After each header is the exact citation of the manuscript and its current location, or the location of the object. For pictures I found in reference books, I added the author’s name and the book’s page number in parentheses at the end. More complete citations for these latter sources are in the bibliography. These are my redrawings, because I do not wish to be infringing the copyright of the photographers of the original images, or the reproduction rights of the owners of the artworks. The artworks themselves, of course, are out of copyright. Displayed in the Museum of London, viewed and noted Sept 1992. This was displayed in the Roman section of the museum. Alas, I did not note the accession number nor the estimated date, or even the materials. The inkhorn was pointed on the base, with two “ears” from which it could have been suspended. It has a circular top, with a protruding, decorated lip. The center is a small hole. From the Los Angeles County Museum of Art, AC1997.253.33a-b and AC1997.253.34a-b. The first set is described as bronze inlaid with copper, 3 and 3/8 in tall, 2.5 inches in diameter. The second set looks very similar, though the pot is less corroded. It is 3 3/16 inches tall, and 2 3/8 inches in diameter. The lid of each clearly has riveted loops on its rim – two are visible, with perhaps two others on the sides away from the camera. The lid has a central raised dome with a knob on top. The knob would make it easier to remove the lid. The inkwell itself has an inner lip that the lid fits over. The hole in the center is fairly large. There are decorative bits applied to the body of the inkwell, but no indication of loops for strings. Similar decorative patches on the second inkwell has a ring on a post attached, and it swivels up and down. These match the loops on the lid, making it possible to suspend this inkwell from four strings, with the strings going through the lid as well. The example here is from the London Museum -- I sketched it when I was there in September, 1992. It is made of tooled brass. I’m not sure how it would be carried, but my guess is that it was NOT worn hanging off the belt. My guess is that one would use this by putting the inkwell on the table, with the pen-box hanging off the edge of the table. This does not strike me as very secure, but a full bottle of ink is probably heavy enough to balance the box of pens. I don’t know if the penknife would be put in the pencase, though, as that would add considerable more weight. It looks as if there are loops for the cord on the side. The base is a seal, and this could hold sealing wax as well. This charming traveling set is on display in the Huntington Museum and Art Gallery, in San Marino, CA. In March, 1997, it was in a case on a table in a bottom-floor room of the Art Gallery -- in the same room as the painted miniatures of, among others, Queen Elizabeth I. Here are my sketches of the opened penner and ink pot. The base of the inkwell has a threaded hole, into which the base of the penner can be screwed, making it all one. This definitely could not be worn looped over the belt, but it could be stuck behind it and carried securely because of the large inkwell (which is still carried vertically). The screw top of the inkhorn is in the shape of a crown.